A centralized storage point for your digital data means easy access for you and your colleagues, but it can leave you vulnerable to an unexpected power outage that wipes out valuable information. This stand-alone UPS provides backup power for your high-performance devices, so you can save information and shut down safely without fear of losing data. Provides ample backup battery power to keep devices running in the event of an electrical outage. 6' cable offers flexible placement options. Provides ample backup battery power to keep devices running in the event of an electrical outage. Ideal for high-performance electronics, such as computers, network devices, POS (point-of-sale devices) and video game consoles. LCD screen provides critical at-a-glance information, including input and output voltages, battery charge status, load percentage and estimated run time. Automatic Voltage Regulation (AVR) corrects power fluctuations instantly, helping to preserve battery power for emergency situations. PowerChute software monitors power quality and automatically shuts down your equipment in the event of an extended power outage. Backed by the manufacturer's $250,000 connected-equipment guarantee and 3-year limited warranty. 10 outlets, 5 with battery backup and surge protection, let you keep multiple devices protected against power outages and fluctuations. Reliable power protection for critical home and small business devices. 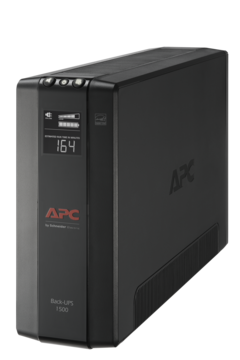 The new APC Back-UPS Pro Compact Tower models provide quality power protection and valuable features in a smaller and lighter design. By backing up your critical electronics, you protect your valuable equipment and data, stay connected during blackouts, and increase the usable life of your investments. The APC Back-UPS Pro Compact Tower series guarantees certainty and peace of mind in a connected world. Ideal for PCs, home office electronics, networking devices, point of sale equipment and gaming consoles. The new BX1500M offers long battery backup runtime for your critical devices during a blackout. When a power outage or fluctuation occurs, you can continue to work on a PC, access the network, and game online. The BX1500M gives you time to save your work and safely shut down electronics in cases of extended outage. Smaller and lighter than ever before, the new Compact Tower models provide convenient installation and use. Expect the same Back-UPS Pro line quality power protection and valuable features in a more convenient package with the new compact towers. In regions with poor power quality, it is quite common for the power to fluctuate widely without actually going out. The BX1500M UPS protects connected devices from dangerous surges or spikes in voltage. Automatic Voltage Regulation (AVR) technology consistently maintains safe voltage conditions without draining the battery, saving backup runtime for power outages. The BX1500M also provides 1Gb dataline surge and spike protection for telephone, Ethernet, and coaxial cable connections.